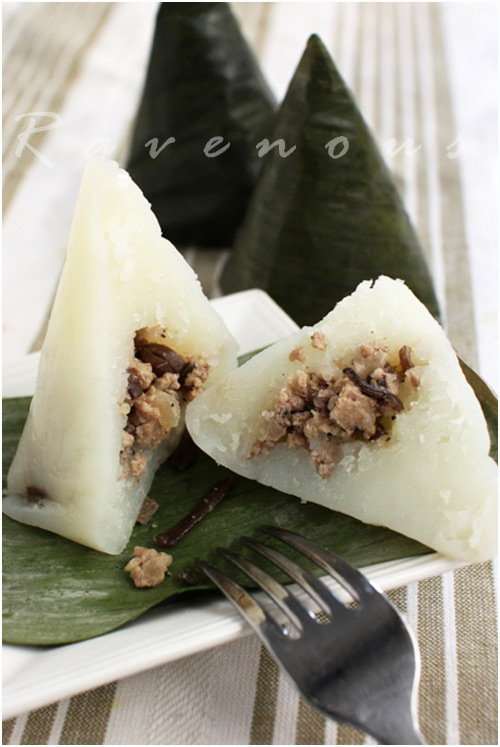 Banh gio (steamed minced pork rice dumpling) is a pyramidal shaped snack food of my childhood. Just like banh pate so, my mom would make dozens of these for my siblings and I to eat for breakfast and as after school snacks. Banh gio is a very simple and inexpensive dish, which is why she made this often and is made with rice flour, sauteed minced pork, onions and wood ear mushrooms. Mom worked hard and never rewarded herself with any fancy dining, clothing, or jewelry while we were growing up–in fact, we almost never ate in restaurants–but she always rewarded us with delicious simple and satisfying foods, and this starchy snack fits the bill. Common as street food for breakfast in Vietnam, banh gio is a very portable snack and can be eaten on the go, although some do eat this with either fish sauce or maggi seasoning. If the dough and pork filling is properly seasoned, we enjoy the banh gio simply by itself. Mom mixes her own flour, a combination of rice flour and corn starch or you can buy a packaged flour like above, found in most Asian groceries. 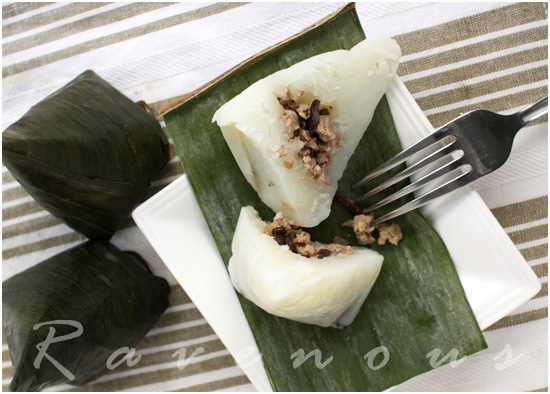 The dough is first precooked and then wrapped with the pork filling in banana leaf and then finally steamed. First rinse the banana leaves and wipe dry with a paper towel and cut up your banana leaves into rectangles about five inches wide and set aside. In a wok or large pan and a small amt of cooking oil, sautee the onions. When they become transulcent, add the pork and wood ear mushrooms and stir. Add the fish sauce, oyster sauce, and black pepper. Cook until pork is done and adjust final seasoning to taste. Cover and set aside. In medium pot under medium heat, add the water and chicken broth and rice flour mix and immediately stir. Add the salt, sugar, oil and continue constantly to stir until the mixture thickens to a mashed potato like consistency, about 10 minutes or so. Remove from heat and now you’re ready to form the banh gio dumpling. The filling can be made a day in advance. You can use all water for the dough or any combination of water and chicken stock. My Mom is a culinary genius. The first time we tried to make this without consulting her, our banh gio was more like a blob. This is my mom’s easy way to make the perfect pyramid shaped banh gio. 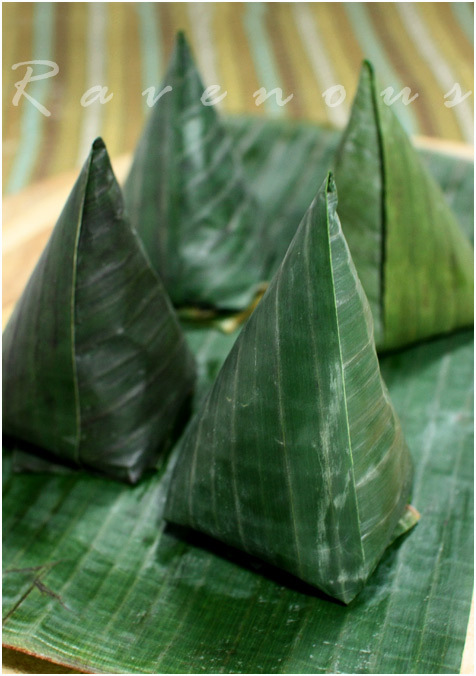 First, roll your sheet of banana leaf into a cone. Take about 1.5 tbs of the dough and stuff it in. Using your spoon, create a small cavity in the dough and add about 2 tbs of pork mixture. Finally add another 1.5 tbs of dough to the base and spread evenly. Fold over the banana leaf and trim any excess. Keep a bowl of water handy to keep the dough from sticking to the spoon. Perfect pyramid shaped banh gio couldn’t be easier! Wrap these with plastic wrap and steam for 15 minutes. While best right out of the steamer, what we can’t eat right away, we throw in the freezer. Just defrost overnight in the fridge and microwave about 2 minutes and it still delicious. It’s the perfect snack, simple but satisfying. cathy: interesting shortcut! thanks for the tip! New to me but looks absolutely delicious. The outside rice looks very fine in texture. Thanks for sharing. This is some good stuff. I remember eating this with a little Maggie when I was a kid. I'm gonna have to give this a try! It was great to finally meet you yesterday at FBF Seminar. I love these as snacks. Yours looks great. I had this yesterday (bought them). mary: the dough is basically a rice cake. if you ever go to VN, you'll see these every where especially in the morning for breakfast. Bao: let us know how banh gio goes for you! Yen: Thanks! 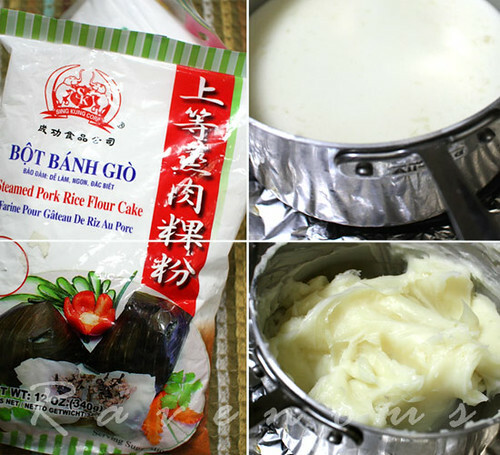 Banh gio are definitely great snacks–it's like eating a portable version of a bowl of rice and pork! So many similarities between Vietnamese and Chinese cooking. I love eating these but I can never figure out how to do the wrapping! Such beautiful dumplings! I recall helping my mom make banh gio when I was younger. I remember biting into the soft, glutinous dough and thinking how wonderfully filling and delicious these snacks were. Can you let me know what kind of steamer you use? Also, any tips for folding the dumpling up to seal it? Can't wait to try the recipe. Ju: Wrapping the banana leaf into a cone first is so much easier than to try to shape the dumpling into a pyramid. Christine: Definitely a snack of our childhoods that brings back good memories. Anonymous: You can use any type of steamer–we use the steaming basket that comes with our rice cooker. 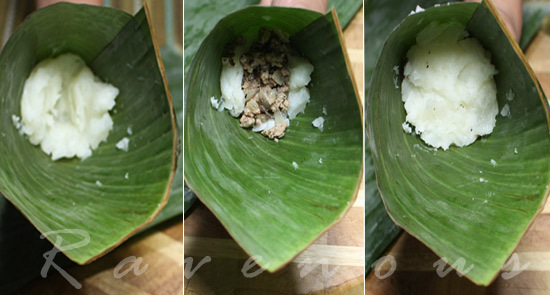 Once you fold over the bottom of the banana leaf and trim it, wrap in plastic wrap to seal. If you can't find a steamer, you can even try to microwave it for about 3 minutes (a suggestion by Cathy of Gastronomy blog). Let us know how it goes! you really wrap it up so beautifully. love the series of photos, they are so elegantly captured. ooh, I love these little things! And if I could make the rice noodles (from one of your older posts)… I think I could do these too. Sounds like your mom made sure you had a really good childhood. The shaping reminds me of Zong Zi, but still a bit different, and the Zong Zi uses sticky rice. I love eating the corners so I really want to try your Banh Gio! Paula Butturini, an American writer, recently published a memoir called "keeping the feast". Part of her story is about her parents cooking and feeding their family with delicious, honest, homemade food. It's really beautifully written and reminds me of how lucky one is to grow up with a mother who cooks and passes on that tradition. Kitchen M: Actually, it's regular rice flour, not glutinous rice so it's not really sticky. Anh: Our first attempt was a failure too..but thank goodness for Mom! Julia: I'm sure you had these during your trip to VN right? Jessica: you're right! the shape is really similar to zong zi. This method of wrapping would work perfectly for it! Ngan Dam: Thank you for that tip..Keeping the feast is what we're trying to do here! Cooking Gallery: Yum, we'll have to check into that variation. Try our method of wrapping and see how it goes! These look amazing and tasty and would be a special addition to add to any table. hey guys! another great family recipe.. good stuff! i actually did not grow up eating this because my mom didn't cook banh gio for me. i've been so deprived. I really enjoyed reading the family food history in this post. Really nice to have an understanding of the story behind the recipe. They also look just amazing. Yum! So nice to hear the back story on personal food stories. Every dish is a memory. I love that you made banh gio – I love them! I have to try it sometimes when I finally feel ready to make dumplings again Great posts! Childhood snacks like this not only brings back fond memories but a deeper meaning when making it again. I'm currently in Japan studying abroad for a few months, and this made me miss Vietnamese food so much. Ahh! oysterculture: it's rather simple food actually, but certainly satisfying. krissy: no worries! we all grow up eating differents, doesn't make you deprived! Charles and Chrystal: Food anthropology was a big topic at FBF and that's something we'll love to concentrate more on our blog. Tam: Thanks for stopping by! Petite nyonya: very well put! unpaused: good luck with your studies and use it as a time to explore japanese culture and cuisine! So so cute. Can they only be don in banana leaves or can use something else like foil? WizzyTheStick: some people do use foil. The only problem is if you reheat in the microwave afterwards you'll just have to remove it. The banana leaves does impart a nice fragrance to the rice dough. So THAT's how you make them into pyramid shape! 😀 Is it the same technique to make banh it? Wow, I haven't seen this stuff in a long time! You just started a craving! I'm sure it will be sooner rather than later that I will use this recipe! Thanks for making me smile this afternoon. Yum – it truly is the perfect snack! Thank you for sharing! Looks delicious. I always wondered how they got them in the pyramid shape. The photos really help. We have those too! We call it Bak Chang (hokkien dialect). Love how you wrap yours – tall and sleek! Elegant dumplings they are. Diana: Blog about if you ever make it! Marc and Tigerfish: it's so easy once you try this mom's technique! I wonder if they can be boiled. I don't have a big steamer. Can you share your mom's recipe for the the flour mixture? What is the rice flour to cornstarch ratio? What is FBF? I am also curious about your mom's recipe beyond the bag! Wow! I missed making this one. I used to be with my mother in the kitchen making this. These bring back wonderful memories! 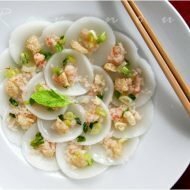 Hey, wondering if you know how to make the Vietnamese dessert that is similar to this. It’s been so long, but I think they were made in a similar fashion but had a sweet filling of shredded coconut and something else…I want to say sesame seeds but my recall may be a bit off. I know it was steamed in coconut leaves and I believe it is also conical in shape. I love eating it and would love to see a recipe for those. Also, have you tried the steamed pumpkin with custard inside? My dad made these back in Laos and I would love it if someone can post a recipe. 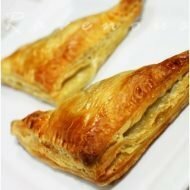 Thanks for taking the time and effort in posting such wonderful recipes on your blog. One last thing, surprised I haven’t seen an authentic pho or bun bo hue recipe. Are those in your future repertoire? I sent a note but on reading the comments have the anser to my initial question of using something other than unavailable banana leaves. Still musing about using other grains with rice. 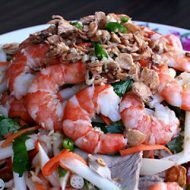 Wow, I have never heard of banh gio before until I was looking at your banh cuon recipe! This reminds me of a chinese/vietnamese style of banh beo that my family makes! It uses the same filling, but we use the banh beo and layer it into a layered block. I am excited to try this out because it reminds me of my family’s cooking! It looks so delicious and mouth watering just from looking at your pictures! Thanks for sharing the recipe, and I hope to try it out soon! I just started my own blog for class, its http://www.lifeofmichelleho.com. Made these tonight! They were awesome, although the first couple I made were too big. I think I made them too big in general, I had a lot of filling left over! Thanks for the recipe! I will definitely try again with my leftover filling! I’d add a boiled qual egg for another layer of protein.